In 1915, a group of armoured cars were found unsuitable for the trench warfare happening in Flanders. That’s how an entire army corps got sent to the Russian front. What happened to them there is the subject of the book King Albert’s Heroes by August Thiry, recently translated into English. It’s a hypnotising story of survival, detailing the experiences of a unit of 10 armoured cars and 400 Belgian soldiers during the First World War. This Belgian Expeditionary Corps of Armoured Cars (ACM) was meant to fight in Flanders. However, the vehicles proved unsuitable for trench warfare so – following an agreement between King Albert I and Tsar Nicholas II – the complete corps was transferred to the Russian Front where it saw action against German and Austrian forces. Taken by surprise by the Russian Revolution, the men realised there was no easy or safe way to return to Belgium. So they decided to “take the long way home”. 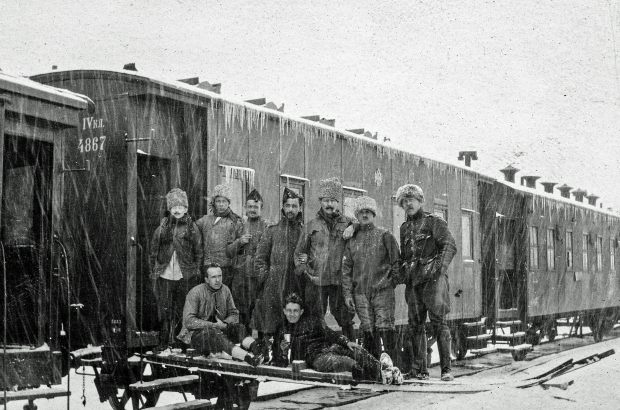 This involved a gruelling and often hazardous odyssey across Russia, Ukraine and then along the trans-Siberian railway to China and Vladivostok. There, they boarded the US army transport ship The Sheridan and sailed across the Pacific Ocean. Arriving in San Francisco in May 1918, the ACM Corps were treated like heroes and paraded around major cities, from Sacramento to Salt Lake City, Chicago, Detroit and Buffalo to New York. They finally returning to France just months before the First World War ended. The 2015 animated film Cafard by Flemish director Jan Bultheel recounted this story, but it was based on Thiry’s book, first published in Dutch in 2008. There is now an exhibition dedicated to the story at the In Flanders Fields Museum in Ypres. August Thiry: I remember taking a Russian-Dutch dictionary from a shelf in the Library of Slavonic Studies at the University of Leuven. A small booklet next to it dropped to the floor. I picked it up and was immediately captivated by the story. It was the memoir of a lieutenant in the Belgian army who was describing his incredible experiences in an armoured car unit. After conducting extensive research, I published a book in 2008 on the ACM Corps. Why was the story so captivating? It’s a fascinating human interest story of how a group of men showed great spirit and ingenuity to survive the First World War, local Cossack warriors, the Russian Revolution and two harsh Russian winters. Not to mention crossing the breadth of Siberia and two oceans. They were all young men who had volunteered to go to war, but never could have imagined they would be caught up in such a long and perilous global odyssey. The book focuses on two soldiers specifically. Yes, two of the ACM soldiers had the same surname as me. That gave me extra motivation to research their stories. I eventually discovered that Marcel and Oscar Thiry were indeed distant relatives. The book also focuses on the exploits of two other soldiers in the corps: world wrestling champion Constant Le Marin, and the eventual leader of the Belgian communist party, Julien Lahaut. What other original material did you come across? I was able to track down hundreds of letters written by the soldiers, and many of them also wrote detailed diaries of their experiences. In addition, I have been able to collect over 1,000 original photographs of the ACM Corps. Many of the soldiers were proud possessors of Kodak Eastman’s new Brownie camera, which they used extensively. Also, while parading in the States, their photographs appeared in numerous newspapers. Why were the soldiers paraded as heroes across the USA?